On July 5th 1814, British and US troops met on the plain at Chippewa, Canada. The Battle was to last nearly 3 hours. The battle was to show the whole world that the army of the young country of America had become a professional military arm, capable of holding its own against the world’s best armies. Brigadier General Winfield Scott, commanded the First Brigade of the Left Division of the US Army. He had tried to obtain the correct blue uniform for his men during the spring of 1814, but failed and was forced to accept the grey jackets usually worn as fatigues or undergarments, instead of the regulation short tailed blue coatee. His men would make this humble garment famous, and today the grey uniforms of the West Point Cadets are worn to perpetuate the memory of the Left Division during the 1814 Niagara campaign. The British were already deployed on the plain. The British commander General Sir Phineas Riall, upon seeing the grey-clad Americans, believed he faced nothing more than “Buffalo militia”. The British artillery were ordered to open up on the American lines and despite the heavy fire from the British guns, Brig. Gen. Winfield Scott’s brigade stood firm. 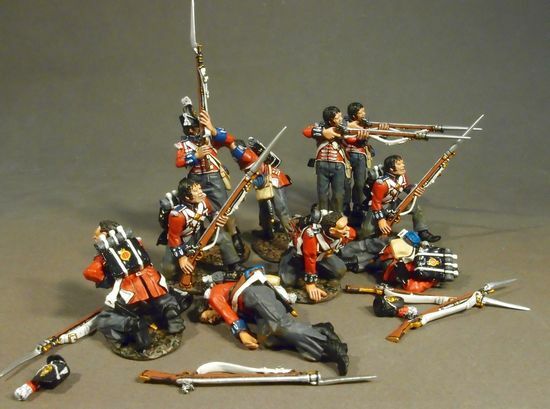 Riall soon realized he had made a mistake in identifying the American force as militia, and declared to his staff “Those are regulars, by God!” The British went on to suffer heavy casualties and were forced to retire. Riall’s army of 1,500 redcoats suffered 148 killed, and a further 360 wounded or captured. Scott was to lose 61 killed and 270 wounded of his 1,300 men. The Battle of Chippewa was an important event in the history of the US army. After two disappointing and demoralizing years of combat in the War of 1812, American regulars finally won a convincing victory over the British army, whose troops were among the best in the world. The American Left Division were to continue their advance along the Niagara peninsula, leading to the next major engagement at Lundy’s Lane on 25thJuly 1814. The first set should be available in February 2008, with regular monthly releases throughout the year. There are a total of 12 sets planned for the “Grey Jacket” collection. The War of 1812 range will continue with future releases including artillery, and cavalry, as well as several other of the more colorful units that took part in this conflict. The War of 1812 range will run alongside the French and Indian War range, with regular monthly releases for both periods. 1812M-001 -- U.S. Marine Corps 1814, Marine Officer. BCH-003 -- 1st Regiment of Foot (Royal Scots), Line Infantry Firing, Bare Headed. Released May 2010. Limited Edition of 500. BCH-004 - 1st Regiment of Foot (Royal Scots) - 2 Figures Kneeling Wounded. Released June 2009! Limited Edition of 500! Pre-Order Now! Released November 2009. Limited Edition of 500. Released April 2010. Limited Edition of 500. BCH-010 - 1st Regiment of Foot (Royal Scots), 2 Flank/Light Company. Released June 2010!Please note this set does not include the Gun. Released June 2010! Please note this set include the Gun Only. Released May 2009! Limited Edition of 350. Released May 2010. Please note this set does not include the Gun. USCHART-003 -- US Foot Artillery, 3 Crew Firing. Released January 2011! Please note Cannon is not included! Released May 2010. Please note this set include the Gun Only.